Remember the 80’s when it was “cool” to wear a fanny pack? That handy little hands free purse about your waste is cool again…IF you are a runner. (Sorry if some of you are being hit with the reality that they ever stopped being cool) 🙂 These nifty little inventions are very handy for holding everything I need on a long run. 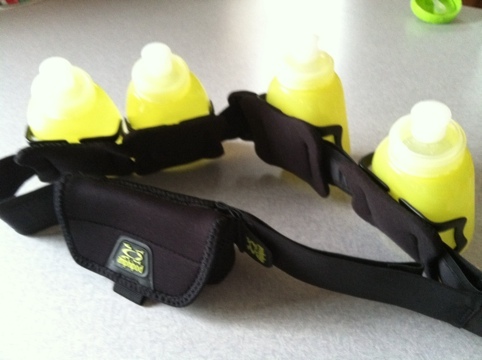 Oh, and runners call them “hydration belts,” they even sound cooler. My hydration belt can carry my iPhone, car keys, 32 oz of fluid (water and/or sport drink), and energy bars. It really is a wonder. I won’t need it for the actual marathon- they have hydration stations along the route- but it is a must have for training.